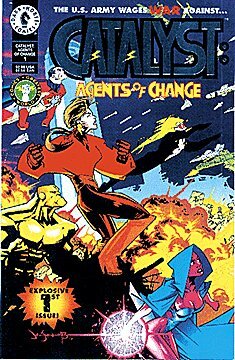 Comics’ Greatest World, later rebranded as Dark Horse Heroes, was Dark Horse Comics’ early 1990s attempt to jump aboard the super-hero comic book market boom. Like most such attempts it died when the market crashed, though some of the characters endured on the side. This here is a very old profile for one the bad guys of the setting. It assumes that you already know the books and settings well, so we’ll have to rewrite some day. Especially since the material is now decades in the past. Base Of Operations: Block 13 below Cinnabar Flats base ; then Nevada desert near Cinnabar ; then Golden City. Height: 6’ Weight: 195 lbs. Eyes: Black Hair: Black with white and green streaks. Law is extremely strong and fast – tough enough to almost take mano a mano on a grown Predator. He’s also very smart, completely ruthless and highly charismatic. Being the first person to have been touched by the Vortex, is immune to all of the Vortex touched’s powers. 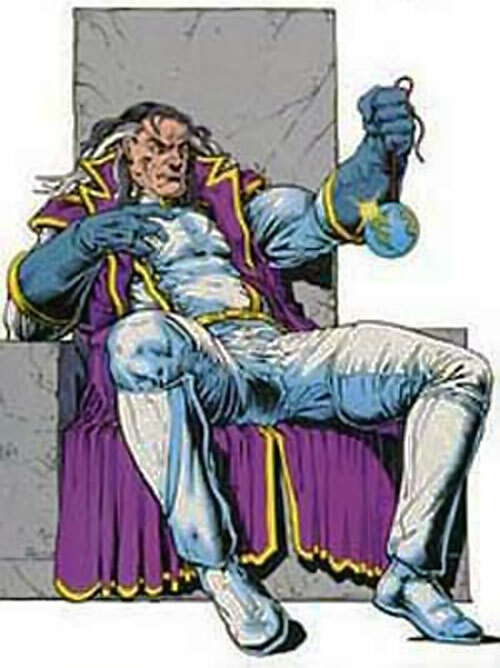 Law was the first man transformed by the Vortex, and the first one to escape from the Block 13 prison there. However, when they checked, the Army couldn’t find records about him. Law had a vision of uniting all supers under his rule to transform the world in his image. He started by assembling an Elite Guard of superhumans would could not use their powers (including Firebase, Nucleus and Redline) by building devices to allow them to ignore their limitations. Law also assembled a small army of malcontents and Block 13 escapees. Law then arranged for the seeming death of Grace, using a lookalike and staging a bogus sniper incident. This allowed him to take power in Golden City. Law promptly became a bloody-handed tyrant. He constructed a machine able to draw the power of the Vortex. Law then encouraged the multitudes in the tent city outside Golden City to pass through the machine’s gate, with the promise that they would gain superpowers. Only 7,6% of the subjects were viable as superpowered operatives. The rest was instantly shot dead by the troops behind the gate. The next phase of his plan was declaring the annexation of California, with Golden City as its capital. He never got to implement that part, however. A pack of Predators had landed on Earth, and started to individually hunt selected targets. These included X, Ghost, Motorhead… and Law. Law almost won that fight. But the Predator facing him narrowly killed him. (The story that was originally to take place had Law narrowly win that fight. Grace and Division 13 would then overthrow him. This didn’t take place as the series had to be cancelled. The discrepancy in Division 13’s fate were never explained). Law is the personification of Machiavellian, *brutal*, power-mad evil. He got corrupted by his ambition and the power he wielded. Killing was as natural as breathing to him, including his own allies when that suited him – or innocents to make a point. He was manipulative, arrogant, extremely confident and utterly ruthless. A true tyrant, he took snap decisions regarding the life and death of others, and was on a constant power trip. Skin armor works against all physical and energy attacks (+2). Skin armor only work against Vortex-derived powers and attacks (-2). Genius, Gift of Gab, Leadership, Scholar (super-powers). Arch-Enemy (Grace), SIA toward Power, SPI (megalomania), Serious Rage. Source of Character: Dark Horse’s CGW.